We underestimate the amount of resources it takes to achieve commitments. And we are reluctant to ask for support. But, we need to ask in a deliberate way. How can you motivate others to work with you in achieving your commitments? By creating a community of supportive relationships. If you include networking as part of your routine, then you will have the resources you need to achieve your commitments. This means being intentional with your work relationships and knowing how each person connects to a common purpose. Once you have crafted your 2-minute story of commitment, make a list of whom you will share it with. 1- Start with People you trust. 3- People you work/collaborate with. This group includes people who are not in groups 1-3. It may be stakeholders, people you need on your side, or people who have something that can help, and most importantly: PEOPLE WHO WILL NETWORK ON YOUR BEHALF. 5- People from the larger community. 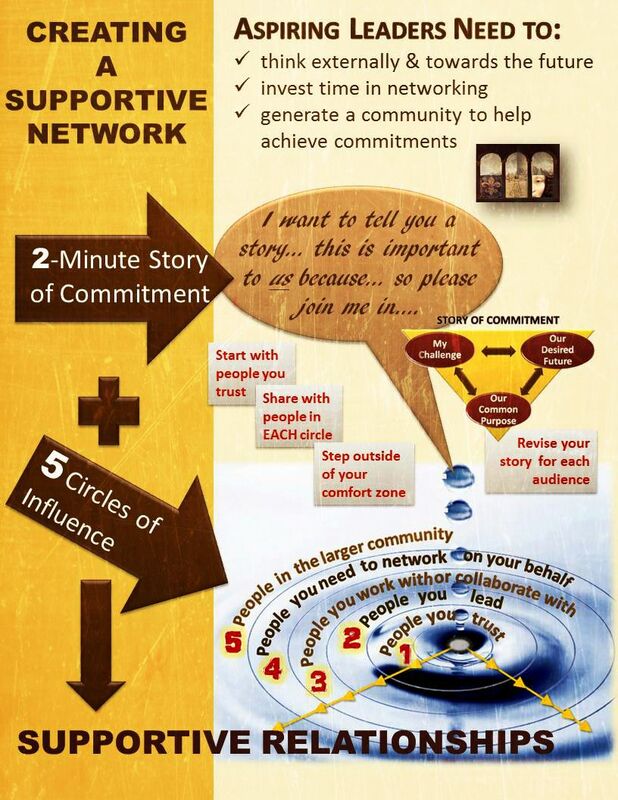 Begin sharing with people you are most comfortable with and continue through group 5. Start with at least 3 connections from each group. Revise your 2-minute story of commitment each time you tell it depending on your audience. Over a period of weeks or months, you will create a community of supportive relationships. How is networking working for you? How diverse is your network? Can you think of a different way to grow your network? Ganz, M. (2007). TELLING YOUR PUBLIC STORY: Self, Us, Now. Cambridge: Kennedy School of Government. Ibarra, H. & Hunter M. (2007, January). How leaders create and use networks. Harvard Business Review. Uzzi, B. & Dunlap, S. (2005, December). How to build your network. Harvard Business Review. This entry was posted in Leadership, Networking, Relationships and tagged circles of Influence, leadership, networking, relationship building. Bookmark the permalink.